When I was little I used to call okra, oakridge - like the Oakridge Boys. Or maybe it was the other way around. Anyway, whenever I make it I get that song in my head. The only one I know by them. You know, the umm bop-a umm bop-a mwow-mwow. But, I digress. The reason I am bringing okra to your attention is because it is one of the very few green things my carnivore will eat. Well, it is sorta green. See he only eats it fried. And I don't blame him really. Being a southerner I think just about anything is better fried. And, when I hear my mother's voice telling me to make sure there is at least one green thing on our dinner plates, but zuchinni is out of season and there isn't a can of peas in the house - well this is my go to green(ish) veggie. 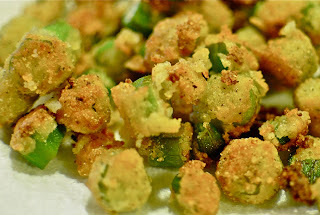 I loooove okra! Thank you for reminding me. I never think to get it. We love okra! And yes, it's totally green. Did I ever tell you that I sat on the front row for an Oak Ridge Boys just a few years ago... sad but true.